It’s that time of year again when big New York City restaurants lower their prices and offer special menus for winter restaurant week. As usual I am trying to go to at least two meals- preferably lunch since that’s the better deal and preferably something new. This year I made my first reservation for Aureole. Aureole had closed a while back and relocated from its former townhouse to brand new digs right near Bryant Park. The space was pretty impressive walking in. A gorgeous big dining room with huge ceilings and lots of natural light from the windows to the left. This was my first time dining at a Charlie Palmer restaurant so I was pretty excited to see what was in store. I had a table reservation for two but since it ended up being just me I asked for a seat at the bar instead. Thanks goodness I did- this may be my new favorite people watching bar.! The big windows in the corner looked right out onto the end of Times Square. I had a ton of characters outside to keep my bread munching,viewing pleasure all lunch long. As I perused the special lunch menu I noticed they offered two bottles of wine, one red and one white, at a special $24.07 restaurant week price. What a deal! If I had a dining companion I would have gone for that immediately but instead I settled on a reasonably priced glass of sauvignon blanc. Obviously in a meal like this one should never order the salad. Salad can be made at home no problem! However I was really craving the goat cheese so that’s what I ended up ordering. Boo me. I honestly thought the winter vegetables and goat cheese it came with would be pronounced. 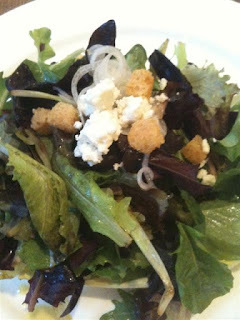 Instead little squares of veggies about a centimeter big were sparsely strewn throughout the bottom of the salad while the goat cheese lay in a tiny clump on top. It wasn’t horrible, it just didn’t have any oomph….That’s what I get for ordering a salad I guess. This decision was a very difficult one for me as was the appetizer. I really wanted to order the pork belly but I knew I was heading to the beaches of Mexico in a couple of days. All I could picture was this pork belly inside my pork belly and well…Let’s just say pigs and bikinis don’t mix, so I ended up with the skate. Luckily this choice ended up being perfect. The skate came out looking absolutely delicious with a crisp golden brown crust and bright yellow raisins and green spinach underneath. 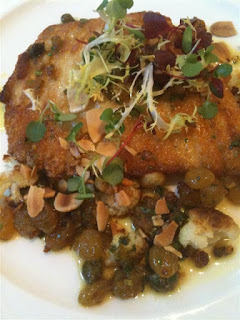 The blend of sweet raisin, smoky toasted almonds and slightly salty skate was perfect. The caper curry sauce had just a little bit of kick that made it really balanced the dish and made it quite unique. 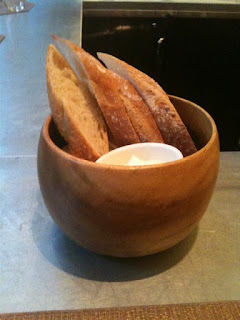 This dish might even be better than my skate from Aldea. I didn’t even look at the second choice honestly. Once I saw bananas, peanuts and caramel corn I never looked back. This dessert was fantastic! 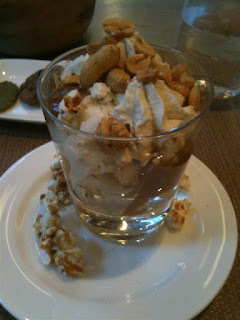 I am in love with these ingredients and Aureole did this sundae justice. Sticky sweet caramel sauce and a healthy helping of salty peanuts were swirled into the delicate vanilla Chantilly and topped with some decadent popped caramel corn. My only slight complaint not finding the large amount of bananas at the bottom until halfway though the dessert, but hey it was damn good. 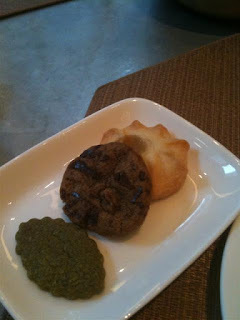 As a parting gift they brought out a little plate of treats- a green tea, chocolate chip and passion fruit cookie. I was too full at this point to really indulge but it was a nice little gesture at the end. 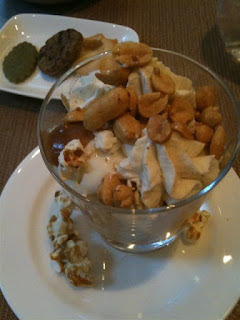 Overall I thought the food at Aureole was fantastic. There was a minor service issue. I had to wait about 20 minutes after finishing my first course for my second course to arrive. That’s an exceedingly long time at lunch, especially when your alone. There was also a family dining inside with a very young child who decided to scream and cry for most of their stay. I felt a little bad for them but is Aureole really a place to take a two year old? That aside Aureole was fantastic. The food, ambiance and relaxing bar stools really helped me to unwind and really enjoy my meal. Next week I have a reservation for Convivo when I return from Mexico. Hopefully that will be just as good. Thanks Hayden! Let me know how it is! I actually had to change my reservation last minute :( Enjoy!